Bai Design Kites specialise in custom kite graphic design, working with Revolution Kites and Los Hermanos to produce striking, high performance kites. Bai Design Kites was created out of our love of kite flying and our long standing friendships with Pedro and Esteban Gonzales and the guys at Revolution Kites. Stephen is a world-renowned kite flyer and designer, having been a member of the World Sport Kite Champion Team Skydance (winners of the European Cup (’95,’96 &’97) & the World Cup in 1996 and 1997). … there’s a kite out there for everyone and my aim in life is to find and fly them all! 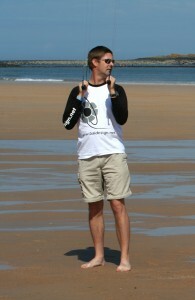 In 2000, Stephen helped create The Flying Squad International Kite Display Team. The Flying Squad are best known for their choreographed demonstrations and for their inclusive rev-team techniques. 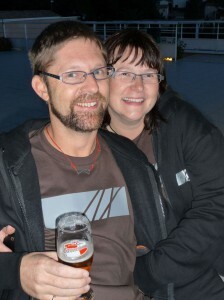 Stephen also coaches kite flyers and teams and continues to support ‘revclinics’ in the UK and Europe. Susan is one of the leading female rev pilots in Europe and was also a founder member of The Flying Squad. As a former European Sport Kite Judge, Susan brings a wealth of experience to the team, along with that all important feminine touch. She plays a key role in choreographing the team’s routines and is one of the team’s core flyers. I love flying in team with the guys – but also I love having my own, more feminine, kites that let out my more girly side. Between us, we have accumulated over 25 years experience in flying revolution kites, especially in team conditions. We have destruction tested many kites over these years (some deliberately!) and have worked with Revolution to refine and develop their range.